Extracting extreme performance from highly-parallel applications just got easier. Intel® Xeon Phi™ coprocessors, based on Intel Many Integrated Core (MIC) architecture, complement the industry-leading performance and energy-efficiency of the Intel® Xeon® processor E5 family to enable dramatic performance gains for some of today’s most demanding applications—up to 1.2 teraflops per coprocessor. You can now achieve optimized performance for even your most highly-parallel technical computing workloads, while maintaining a unified hardware and software environment. While a majority of applications will continue to achieve maximum performance using Intel Xeon processors, certain highly-parallel applications will benefit dramatically by using Intel Xeon Phi coprocessors. Each coprocessor features many more and smaller cores, many more threads, and wider vector units. The high degree of parallelism compensates for the lower speed of each individual core to deliver higher aggregate performance for highlyparallel code. You can use Intel Xeon processors and Intel Xeon Phi coprocessors together to optimize performance for almost any workload. To take full advantage of Intel Xeon Phi coprocessors, an application must scale well to over onehundred threads, and either make extensive use of vectors or efficiently use more local memory bandwidth than is available on an Intel Xeon processor. A broad ecosystem of programming languages, models, and tools support Intel® architecture and all of them can be used with both Intel Xeon processors and Intel Xeon Phi coprocessors. Applications that run on one processor family will run on the other. This uniformity can greatly reduce the complexity of software development. Existing applications will need to be tuned and recompiled to maximize throughput, but your developers won’t need to rethink the entire problem or master new tools and programming models. Instead, they can reuse existing code and maintain a common code base using familiar tools and methods. Code can be optimized just once for both Intel Xeon processors and Intel Xeon Phi coprocessors. The same techniques deliver optimal performance for both, so the investment you make in parallelizing your code will deliver benefits across the full range of computing environments. Intel Xeon Phi coprocessors provide up to 61 cores, 244 threads, and 1.2 teraflops of performance, and they come in a variety of configurations to address diverse hardware, software, workload, performance, and efficiency requirements.1 They also come in a variety of form factors, including a standard PCIe* x16 form factor (with active, passive, or no thermal solution), and a dense form factor that offers additional design flexibility (Table 2). The Intel® Xeon Phi™ Coprocessor 3100 family provides outstanding parallel performance. It is an excellent choice for compute-bound workloads, such as MonteCarlo, Black-Scholes, HPL, LifeSc, and many others. Active and passive cooling options provide flexible support for a variety of server and workstation systems. The Intel® Xeon Phi™ Coprocessor 5100 family is optimized for high-density computing and is well-suited for workloads that are memory-bandwidth bound, such as STREAM, memory-capacity bound, such as ray-tracing, or both, such as reverse time migration (RTM). These coprocessors are passively cooled and have the lowest thermal design power (TDP) of the Intel Xeon Phi product family. The Intel® Xeon Phi™ Coprocessor 7100 family provides the most features and the highest performance and memory capacity of the Intel Xeon Phi product family. This family supports Intel® Turbo Boost Technology 1.0, which increases core frequencies during peak workloads when thermal conditions allow. Passive and no thermal solution options enable powerful and innovative computing solutions. 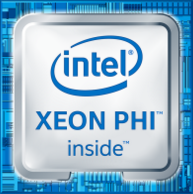 Download the Intel Xeon Phi Family Product Brief (PDF).